Through unique watercolour pastel colours and an original soundtrack made to pull at heartstrings, Studio LICO has already given us two seasons of romantic animated Korean drama ‘A Day Before Us’ with third season ready to premiere on October 5th. To mark the occasion, the LICO A Day Before staff have taken time out of their busy schedule to share with FAD a glimpse into the Korean animation scene. 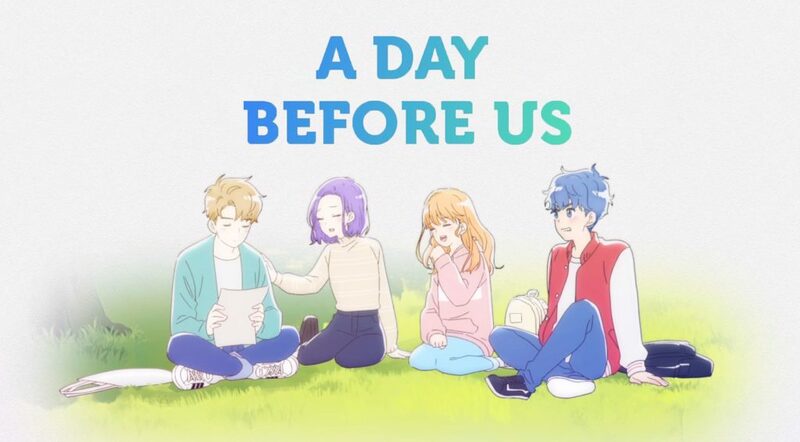 A Day Before Us is an animated romantic drama about the lives of four young people (Yeo Reum, Ha Eun, Wook, and Yeon Woo) and prequels to their love stories. Kept short and sweet, ‘A Day Before Us’ fleeting two minutes on average episodes are exclusively viewable online through Youtube, Facebook and their Naver Webtoon app, a strategic decision explained in full in the following interview. Read the full review on A Day Before Us here. Hello, and thank you for agreeing on this interview! As you may already know, A Day Before Us is the very first anime review ever published on FAD Magazine so it definitely holds a special meaning for us. Would you like to introduce yourselves to the readers of FAD? Hello. We are LICO (Life is Comic)! LICO is a digital content company that tests and produces various digital work based on animation, videos and images while staying on top of fast changing trends and keeping a steady lead on the market. We started with ‘A Day Before Us’ which is a series of short animation films and have the intention of introducing more exciting projects in the near future. Please give us lots of encouragement and attention. Before we get started, could you give three words that best describe the ‘A Day Before’ team? Passion, creativity & fun energy. How about three words to describe ‘A Day Before Us’ as a series? Heart throbbing thrills, youth, a love story. A Day Before Us is a Korean animated story but the correct terminology is animated ‘drama’. What motivated this choice? Are dramas more popular in Korean culture? It started with the idea of creating mobile animated content by keeping it short and sweet yet impactful. 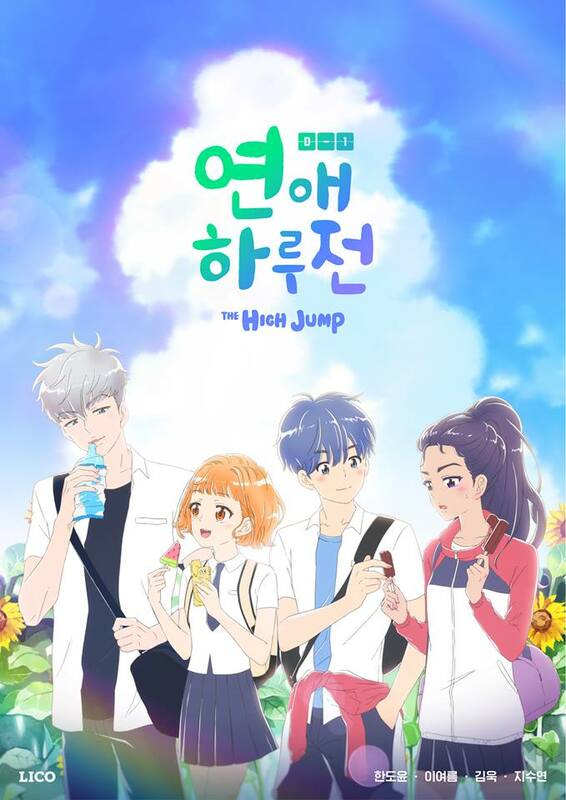 Since this genre of animation is very popular in Korea, we decided to combine the mobile ‘on the go’ aspect with animation and drama as a genre to make it more accessible to our viewers. ‘Drama’ wasn’t a priority though when it came to labelling the series. What would you say are the main differences between Korean animated series and Japanese animated series? Of course each country has their own flavour and traits when it comes to artwork, production and story and we didn’t approach the creation process of the series by wanting to differentiate from Japanese animation. Our goal was to create a beautiful love story to which everyone can relate to and we’ve worked hard to make it come to life. The stories in themselves show recognisable traits of day-to-day lives of Korean people enough that it makes the style of story and animation our own. You’re about to launch the third season of A Day Before Us and are now well into the project. When you first started creating the series, did you already know what sort of art style and colours you were going to use? What was the creative process in building this very unique look? The basic concept for the artwork was to convey the fresh sensibility of the 10’s and 20’s with watercolour painting. At first, watercolour paintings were not suitable for 2D animation, and there were many difficulties in producing them. The end product was a result of LICO’s efforts to create something new without compromising on quality. Thank you for appreciating our unique art style. Where did your inspiration for A Day Before Us’ aesthetic come from? In the past 90’s and early 2000’s, there were a lot of genuine comics that had a stronger ‘handmade’ feel than can’t be found in today’s publications. Inspired by these things, we tried to express this sentiment with a watercolour painting style animation and that’s how the style of ‘A day Before Us’ was born! Could you tell us more about the ‘A Day Before’ soundtrack? The music is always filled with feeling & emotion and fits perfectly with each episode. Do you work closely with the music artists? The reason why the songs are best suited to each episode is that the ‘A Day Before Us’ OST is made in-house rather than outsourced. We work by establishing each concept for the soundtrack through meetings with LICO songwriters and animation producers where we decide on lyrics, compositions and arrangements. We then record the album with a singer which has been carefully chosen to fit the track. We are very grateful to the singers for helping us complete the music by adding their beautiful voice to our songs. You’re currently showing ‘A Day Before Us’ on Youtube, Facebook and on the Naver Webtoon platform which makes the series exclusive to the web. Was this decided from the start or was television broadcasting an option for the series? Consumers for this kind of content in Korea are relatively young with a target audience in their ten’s and thirties, most of them attuned to indulging in a wide variety of videos and images on the web. Also, because animation and cartoons are not popular on Korean TV, the series was intended from the beginning to be made as a serial animation for the internet. We’re all very excited for season 3 (officially ‘season zero’) of ‘A Day Before Us’. What can we expect from this new season? What was school life like for the main characters of ‘A Day Before Us’? With the past usually seen as ‘dark’ or ‘old news’, it only takes a moment revisiting it to realise how pure and fresh those days were. Season 3 will be about Wook and Yeo-reum’s growth during their high school days while introducing a new attractive character and their story to the plot. Please look forward to it. Finally, as a Korean based animation team made up of various creatives, what is something you would like other countries to know about the Korean art scene? We can’t really speak on behalf of the Korean art community but we do want to say that, in the case of ‘A Day Before Us’, we wanted to unveil to the world a story made from genuine Korean sensibility and original Korean-made artwork. Something with a unique charm through the soft watercolour painting style and thrilling moments that take place in the world of love and dating. Thank you Life is Comic for your time! A Day Before Us Season 3 (Season 0: The High Jump) will premiere on October 5th at 6pm (KST/GMT+9). This entry was posted in ANIME, INTERVIEWS and tagged Korean animation, Studio LICO. Bookmark the permalink.